We build web sites that get the job done! Since 1996 JEFS Online has created 100's different web sites for all types of businesses and organizations. From simple designs to complex multimedia productions we create the web site you want. Your web site will help you; present information, service clients, entertain, sell products, and so much more. We'll create a web design solution for you. We work with you to come up with the best Internet solution to fit your needs and budget. We also offer a comprehensive Search Engine Submission Program that will help put your web site near the top of the Search Engine lists! Add Professional Narration to your Website, Corporate Video, Sales Presentation, Commercial or Any Multimedia Project. Click Here for demos and details. Jef Brown has lent his voice to 1000's of projects over the years. No obligation auditions and estimates available for your project. 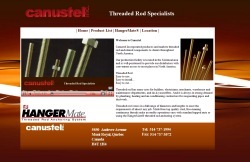 Canustel a dynamic multimedia website promoting the threaded rod products for this Quebec based company as a French/English bilingual site. AA Home Energy Savers a vibrant and colourful multimedia website for an insulation company specializing in an environmental approach to energy conservation through insulation. 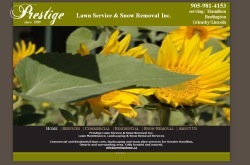 Prestige Lawn & Snow Removal an eye catching animated website for a landscaping company. Features a full motion welcome page and video presentation. NRM Canada a records management company's website acts as a marketing tool and a front end entrance for their clients secure access to online records management software. 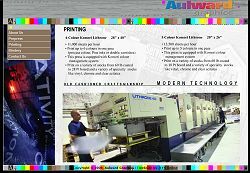 Aulward Graphics is a high end trade printing facility that markets itself as combining the best of creativity and technology, they wanted a web site that also incorporated these elements. The resulting website makes use of high quality graphics and flash animation. 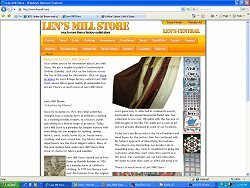 Len's Mill Store needed a web site where they could post specials, printable coupons, multimedia, tv and newspaper ads, as well as information on their various locations. It is neatly presented in this fun, self managed site. 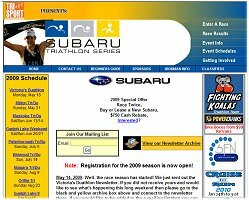 SUBARU Triathlon Series Trisport Canada presents the foremost triathlon and ironman competitions in Ontario. They can completely manage the content on this web site which also includes an online registration system. 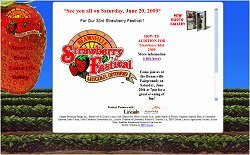 Beamsville Strawberry Festival a multimedia website promoting the annual festival in Lincoln Ontario. Features include a photo album and mutimedia video production. 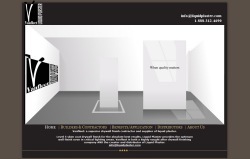 Vanfleet's Liquid Plaster 3D website designed to market and promote their patented plaster products. Includes multimedia and video features. The Sun Records Show is the official musical stage play featuring the music and artists of Memphis' world famous Sun Records. 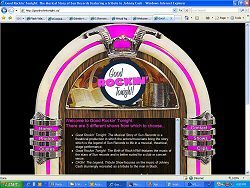 The web site features various multi-media features including video and sound clips presented in a web site that looks like a 50's style juke box. The web site is almost as much fun as the show!! Teddys is both a great sports bar, local landmark and family favourite restaurant. 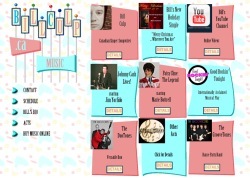 This self mangaed site allows them to present their menus and promote upcoming entertainment and events. 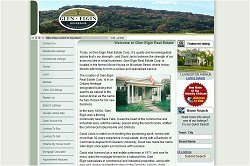 Glen Elgin Real Estate uses this full featured, database driven, real estate site. The easy to use client interface allows them to fully manage and update their listings and company information. Smalltown Auto RV uses this database driven site to showcase their selection of RV's, cars and trucks for sale. The easy to use client interface allows them to fully manage and update their listings and company information. 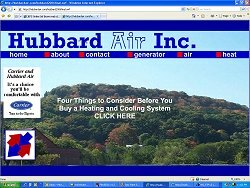 Hubbard Heating and Air website is done entirely in Flash animation programming. This eye catching site is used by this local home comfort business to distribute online catalogue information and to enhance and expand their traditional newspaper ads. Bill Culp this colouful and fun site has a retro 50's feel for this singer-songwriter and music promoter Bill Culp.